Honestly? I can't keep my eyes off of it. I even caught my husband catch a glance from the kitchen. Maybe we're both just in shock that it actually turned out as well as it did! 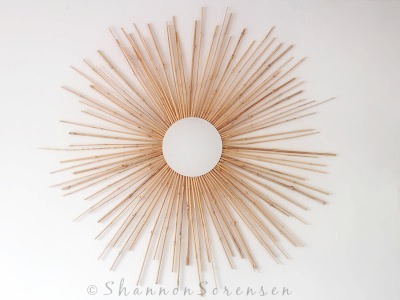 I found the idea for this Sunburst Mirror made with bamboo, from House of 50, and decided to give it my own spin. Lay all the pieces out on the back of the mirror to see how it looks, before gluing them on, making sure to stagger the different sizes. 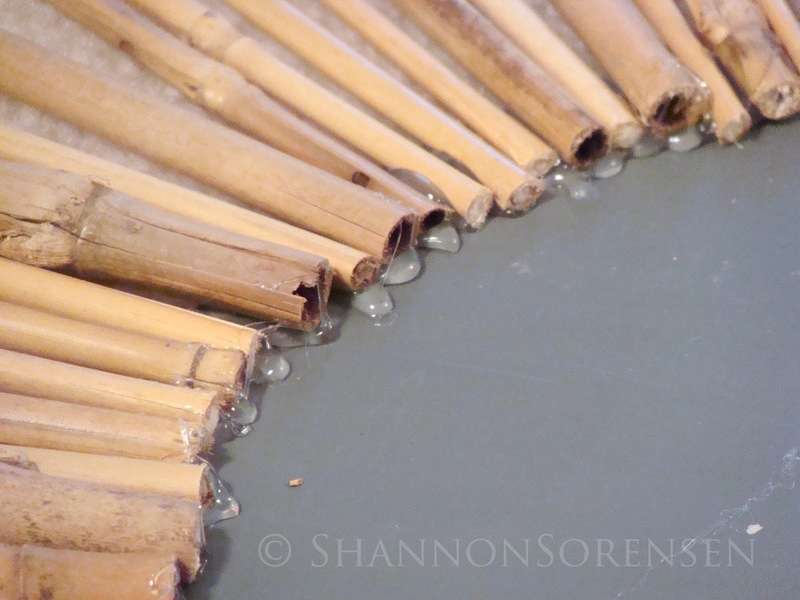 Glue each piece down with a hot glue gun, to the backside of your mirror. 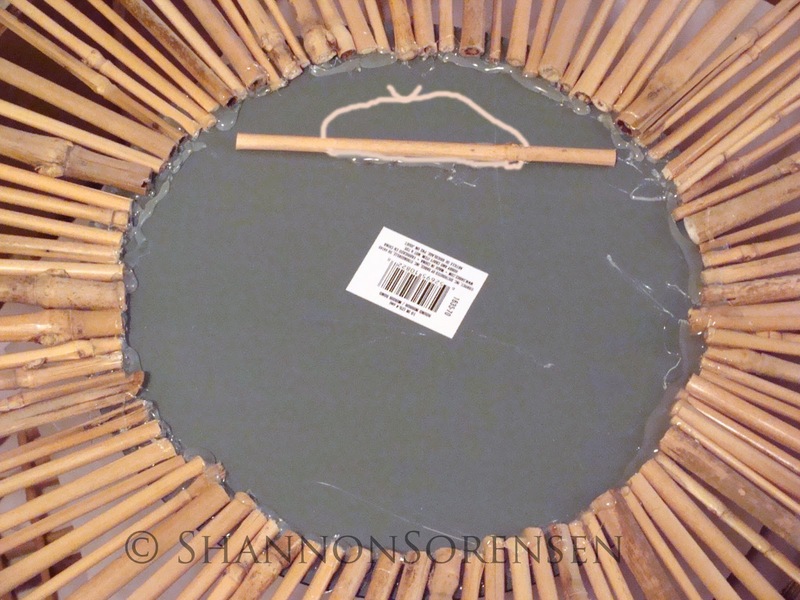 Unlike the tutorial mentioned above, we decided to keep our sunburst mirror its natural bamboo color and texture. I didn't have any mirror hardware, so I decided to get creative with what I had on hand. Using a small piece of leftover bamboo, simply glue a small piece on the back - gluing just the middle, leaving the sides open. Slide a piece of ribbon or heavy string up and under the sides. Once dry, turn over carefully...it was tricky to turn this baby over...try not to kabob yourself! And presto-chango - we did it! Of course I see all the flaws, but that's what makes it unique I guess. It really does make the room feel brighter! 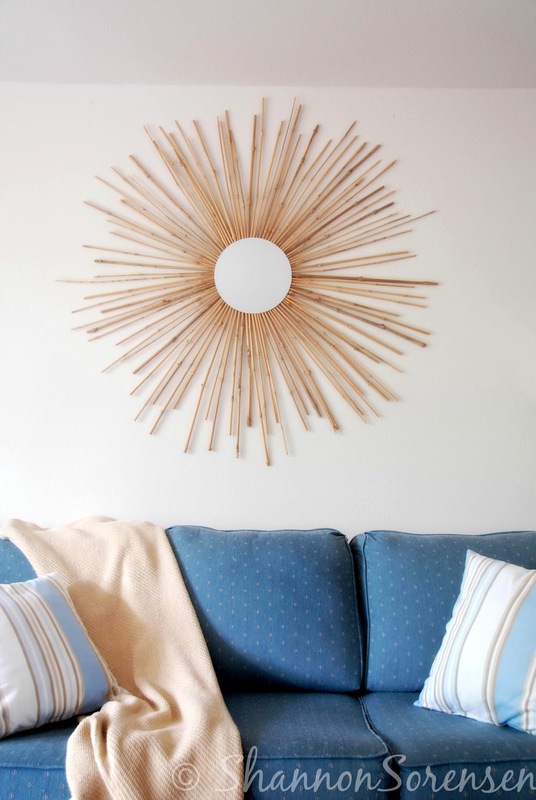 ◉UPDATE: Check-out how well our Natural Bamboo Sunburst Mirror looks in our new Beach Chic Family Room Make-over! i love it!! 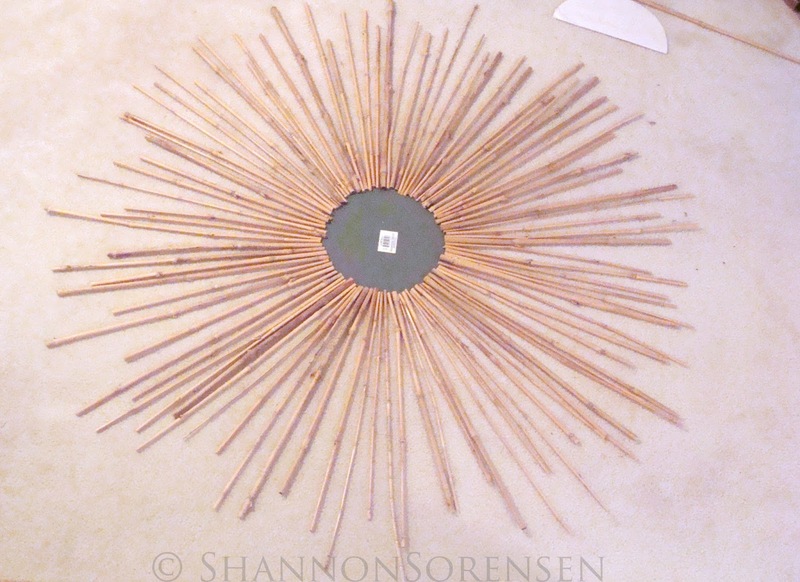 i've never seen a sunburst mirror with bamboo sticks. that is a first for me! and i love it, because it has a "natural" feel if you will. i know some people like to paint everything, but i think it looks great in its natural state like this. very fab girl! This is gorgeous! You really did a great job on it! Thanks for sharing! Love it! It's a great way to brighten up a large space! Nice! I like it in the natural bamboo too! So great!!! Love it. I am making one for a friend soon so this tutorial is much needed. This is probably one of my favorite sunburst mirrors I've ever seen! Seriously! GREAT job! This is awesome! I love it and think I'm going to try it. I'm a follower now! SO glad I saw you on Tip Junkies Homemade Projects post. This looks beautiful. I am tempted to give it a try. This piece really is incredible. It must be such a great eye catcher. Great job on it. This piece really is incredible. It must be such a great eye catcher. You did the great job on it, sure it looks awesome in home entrance or welcoming. That's a great looking mirror and even better price tag! Thanks for visiting my blog and your kind comment. Awesome! You rocked this project. I love the natural look. That looks amazing over your couch!! 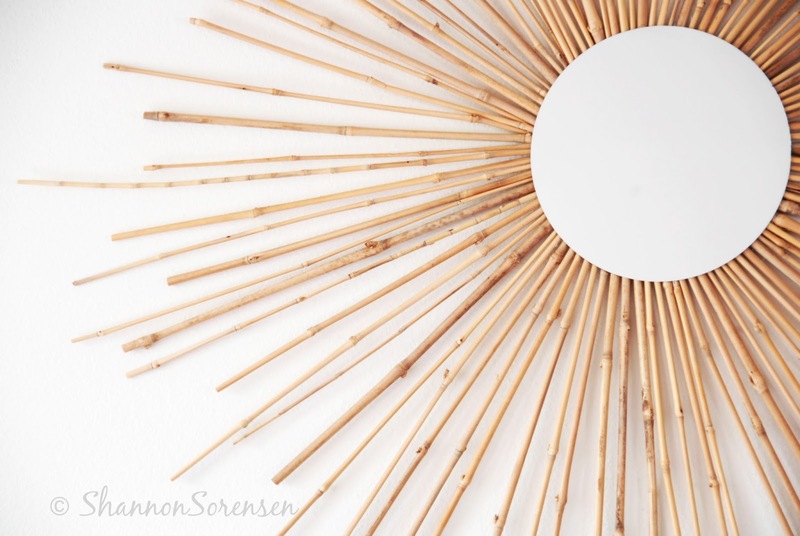 Love that you used bamboo! 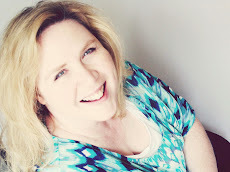 Thanks for linking to Fancy This Fridays this week! Of all the tutorials I've seen, this is my favorite! I'm going to try it and then probably spray it gold since I'm wanting a little glam over my bed. I love this!!! I was just thinking about trying to make one with bamboo. I am still contemplating about it. 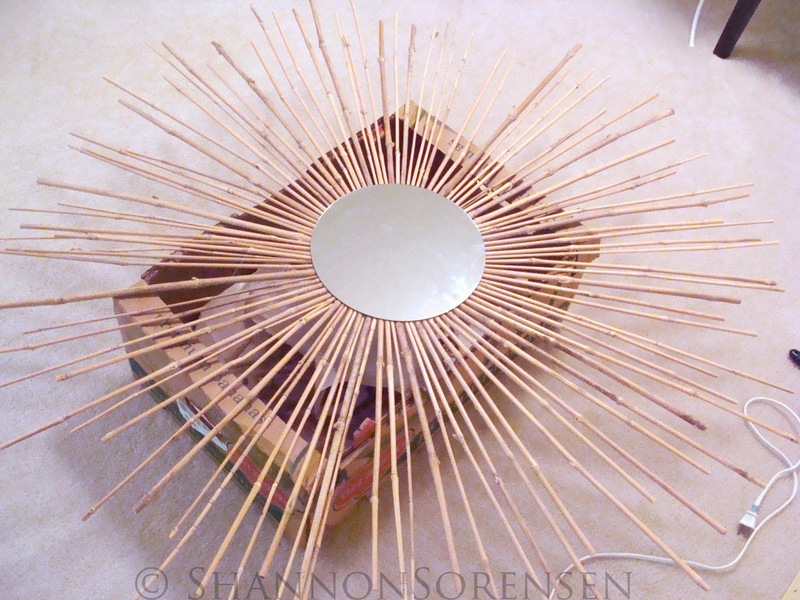 There is just so many DIY sunburst mirrors on the web. I thought doing a bamboo one would be unique. Seeing yours definitely proved that. I was thinking about painting mine silver. I am trying to add a little glimmer to my dining room. Did you ever end up making one? Bamboo painted silver sounds so pretty to add that glimmer to your dining room!